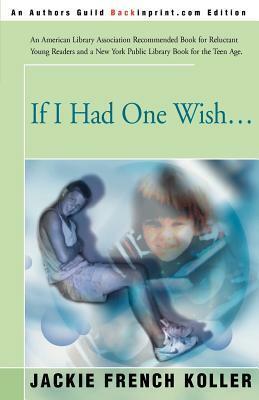 Posted on October 3, 2013 by Anmol K.
If I Had One Wish…, by Jackie French Koller, is a heart-warming tale about two brothers named Alec and Stevie. Alec, who is the older one, despises Stevie, who is five. One day at the mall, Alec helped an elderly “bag” lady. After helping her, the lady gave him a coin and claimed that it would grant him one wish. Alec thought that she was crazy, but he accepted it, not wanting to hurt her feelings. The next day he was in trouble with his parents because he left Stevie alone in the arcade in the mall. Alone in his room he found the coin and said, “If I really had one wish it would be that precious little Stevie had never been born“ (58). Later in the day he was called for lunch, he realized…OH NO… Stevie was not there. Had his wish come true? Is his brother really gone? If he is really gone, will Alec be able to find his little brother? Read the rest of the book to find out the answer to these puzzling questions. I loved this book and I thought it perfectly showed the strong bond between siblings, no matter how much they fight. I would recommend it to anybody with a younger brother or sister. This entry was posted in Book Reviews and tagged book review, family, fantasy, jackie french koller by Anmol K.. Bookmark the permalink.